Pseudodementia walks and talks like dementia, but it often responds positively, with treatment permanently improving cognition. Learn how recognizing the difference can change one's life. Pseudodementia was first coined in 1961 by psychiatrist Leslie Kiloh. Dr. Kiloh noticed patients with cognitive symptoms consistent with dementia who improved with treatment, a pattern inconsistent with the progressive neurodegenerative nature of dementia. Pseudodementia can be caused by a large variety of underlying disorders, but most commonly, it is depression masquerading as dementia. Depressed elderly patients may exhibit substantial cognitive deficits. To further complicate the clinician's task, people with dementia are often depressed. For example, 20% to 40% of Alzheimer's patients have major depression (Brown, 2005). This makes the relationship between depression and dementia very complicated. So the question is how to differentiate the two. In unusual cases, pseudodementia may be misdiagnosed based on causes that are “not real” and even “fake”. This is worth noting because it occurs often enough that professionals, caregivers and patients can benefit from being aware of it. Pseudodementia can be the result of psychological tension that is not caused by a physical illness. Notwithstanding, it is more likely that it is caused by a real brain pathology. In contrast to the gradual onset of dementia, pseudodemented depression comes on rapidly. Furthermore, whereas the pseudodemented patient appears distressed and may express fear of losing his mind, the person with true dementia often seems relatively unconcerned and tends to minimize his problem. The truly demented patient is usually inattentive and has greater impairment of recent than remote memory. In contrast, the depressed patient, though attentive, will complain of both kinds of memory loss and then test better than what he describes. He is also more likely to have had previous similar episodes. While a demented person may cooperate and try to bluff his way through the testing, the pseudodemented person is often uncooperative, insisting that he cannot do it. This should not be confused with malingering but seen more as a reflection of the feeling of inadequacy that goes along with serious depression. When treated (as depression), in contrast to true dementia, pseudodementia often responds positively. While the depression may be treatable, treatment rarely achieves a full reversal of the cognitive impairment that made the doctor suspect dementia. Unfortunately, recent studies suggest pseudodementia carries an increased risk for the subsequent development of true dementia (Brown, 2005). 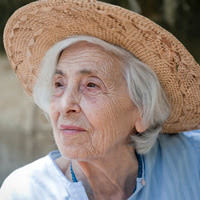 It may turn out that depression in the elderly, at least in some cases, is an early signal of dementia. Still, if at the initial presentation the problem is mainly depression, it is important that it be recognized and treated accordingly. 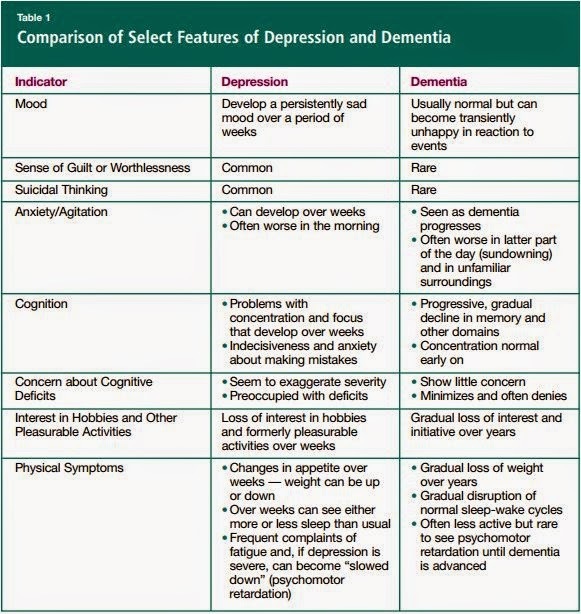 In summary, psychiatric symptoms that bring on dementia-like deficits in the elderly result from a host of conditions. Many of them are readily treatable, if properly recognized. The term "pseudodementia" provides a "starting" language that offers a useful step in getting to a more accurate diagnosis and treatment. A high index of clinical suspicion is essential. Clinical Concerns: Dementia, Depression, or Both? Differentiating in Older Patients The Canadian Journal of Diagnosis. October 2012. I'd like to see more information as to how advanced dementia takes over the entire body and is actually a cause of death. This article comes from an old publication, and its contents are outmoded. The relationships between depression and dementia are very complicated. Research has shown that cognitive deficits associated with depression typically cannot be fully reversed, and often constitute a prodromal feature (early manifestation) of, and/or risk factor for, a neurodegenerative dementia such as Alzheimer's. Moreover, the prevalence of depression is very high in patients who have a neurodegenerative dementia; and the depression symptoms may respond to treatment although the underlying dementia disorder will not. The use of the term "pseudodementia" is very controversial. "Pseudodementia" does not actually mimic true dementia; in course of illness, complaints, and cognitive impairment, the two conditions are quite different. Further, the term "pseudodementia" is considered to be politically incorrect. The term "pseudodementia" literally means false or pretended mental disorder; it implies that the dementia is not real or, even more offensively incorrect, that it is faked. Depression is associated with all sorts of biologic changes, from pituitary-adrenal overactivity, to decreased serotonin receptor activity, to shifts in hippocampal size and prefrontal cortex activity; so even if the cognitive impairment associated with depression responds -- at least, to some extent -- to treatment, it is still associated with "organic" brain pathology. At best, the term is now considered useful only in fostering awareness of potentially treatable psychiatric symptoms, even in cases of progressive dementia. Thanks for the comments. You make a lot of good points, so I'll respond to them one at a time. 1. After you posted the comments above, the article was appropriately updated. 2. Emphasis was added on the complicated relationship between depression and dementia. 3. It was noted that depression treatment rarely fully reverses cognitive impairment. 4. Regarding mimicking, a table was added to this article to help tell depression and dementia apart. This was done to help make it clear that a sophisticated diagnosis can easily tell true dementia apart from pseudodementia. 5. As for political correctness, our readers need competent language and clear information. Though not a happy thought, pseudodementia can be the result of causes that are “not real” and even “fake”. It is more likely that, as you point out, it is caused by real “organic” brain pathology. The article was edited to drive your point home. 6. Even if the usefulness of the term “pseudodementia” is limited to awareness, that still means it is useful and important to offer as a reference on Alzheimer’s & Dementia Weekly. The points you made here substantially add to the usefulness of this information and are very much appreciated. You are doing a great disservice to people in the early stages of Alzheimer's to suggest that some dementia is "not real and even fake." It does not belong in an article discussing depression and dementia because depression with dementia is a huge problem, and the fact that a very tiny, tiny number are faking for one reason or another is irrelevant to the actual problems of depression-caused dementia. In fact, the fakers do not have pseudodementia. (I am aware of a case in which a man faked dementia to get disability payments.) They are just faking. The term "pseudodementia" is losing favor quickly, and rightly so. Barbara, thanks for pointing out the negative repercussions on this diagnosis caused by people that "are just faking". As unusual as it may be, it is worth noting in this article that a pseudodementia misdiagnosis can easily occur based on causes that are “not real” and even “fake”. Unfortunately, it occurs often enough that professionals, caregivers and patients can benefit significantly from being aware of it. That's why it is brought up in this article, and since you mentioned it, the language was sharpened in the article to make this point more clearly. Much appreciated. This is a very interesting article! From my own experience I have found that memories can be stimulated and even reborn for a person with Alz/Vascular type dementia, even in the later stages and there is a definite cross over with depression which in my mother's case has been alleviated with social interaction, CST, memory cafes and a great deal of singing together! So then I have to say I agree with the "fostering awareness of potentially treatable symptoms" even in the later stages of progressive dementia! These effects are not permanent and some results last only a few weeks or months, so the interaction must continue as long as possible to support the person with dementia and alleviate depression as much as possible. As each person is different it must be very complicated for GPs to comprehend how well this kind of treatment is working but it sure does! My 35 year old daughter has recently been diagnosed with pseudodementia. I am at a loss as how best to support her as her social worker (who offers no practical support) has told her she must start looking after her children without support from me; I currently look after the children 4 evenings a week at my daughters request. Surely she needs support more than ever? I'm 51 and was recently diagnosed with pseudodementia. On the nights your daughter wants to have you watch the kids is she there with you, or does she go out somewhere? Sometimes compulsive behavior can be part of the problem and the social worker may be worried about that the social worker may be trying to get her to limit that kind of behavior. Or having too much negative self talk. If you all can do fun family stuff so it's a little bit relaxed for everyone. Otherwise - emotional support and loving help from family is really important. Knowing you're not alone is really so amazingly helpful. Without it it's easier to slip into a deeper depression especially with kids involved - your daughter and her kids need to have a break from the pressure that can build - just be sure not to over tax yourself. You won't be able to help if you begin to be pulled into letting the anxiety build within you too. Get everyone (including you) to take five slow deep breaths - pushing out the belly - hold the breath for just a moment and then slowly release the breath through pursed lips. This is a good activity every time anyone is feeling tense, anxious, angry. Take care of yourself and best of luck to your family! pseudodementia is real!! and is fully reversible. and it does not necessarily implies or is an early progressive dementia. i talk from experience with my own grandfather he was diagnosed with dementia at age of 80, he was depressed at the time, with proper anti depressant drugs, he recovered from depression and ultimately recovered all his cognitive and memory skills which were seriously impaired at the time of his depression. he is now 90 y/o and intellectually sharp as a 40 year old. soo pls stop saying that pseudodementia is not real. This is a horrific diagnosis when it's not pseudodementia. I was diagnosed with this and they were wrong. This diagnosis puts doubt in the minds around the patient, whereas, when he or she crumbles in the arms of another and says "something's wrong with me", it's not taken seriously and whisped away without concern. In the clinical arena, the patient then does not receive care because it's 'all in their head'. I am 49 now and I have had this for two years now. I know this is not pseudodementia because I looked into these strange symptoms, like deep dyslexia and tremors, as they came. I don't understand some of these comments where pressure is put on the patient to recover because I am my own worst nightmare when it comes to getting things done. I just don't stop. But I absolutely cannot do some things. It is so extreme it's like putting a 1st grader in an algebra class and pushing the child to do it. What was there before is gone now in many areas but I can slow down and do some things one at a time. I am expiriencing statis, toxic encephalopathy from statin side effects. I was a counselor before so what I didn't know I knew how to look for answers. I am preoccupied by this because this placed me remote where others don't understand me while I function with what's left. I am compelled to describe these symptoms because it seems others don't understand this. I don't have this. Just compare encephalopathy with pseudodementia and you will see. None of my doctors believed it was the statins doing this until I went off them against medical advice and get better by 20%. Yes, I graph every day. Now, having been on statins for 1.5 years and off them since February this year, the following is what I expirience every day. By the way, I do know I come across pretty well when I write. I'm much different when talking. It's a phenominon that I found a less fractured means of communicating. The following is my current symptoms that remain: Nevermind. It won't let me go over 200 words.